Drive on N2 direction Cape Town. Take M3 direction Muizenberg, Kirstenbosch and continue on the M3 until the first traffic light. Turn right into Rhodes Avenue (M63), direction Kirstenbosch and Hout Bay. 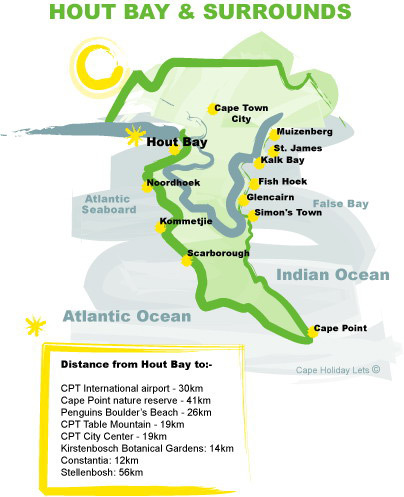 The M63 leads you past Kirstenbosch Botanical Gardens on your right, continue and follow the signage to Hout Bay. Continue over Constantia Nek through traffic circle. In Hout Bay, the M63 is called Hout Bay Main Road. At the traffic circle leave Main Road, turn right into Victoria Road (M6). Turn left into Victoria Road at the traffic lights. Follow this road towards the Harbour. Continue through two traffic circles and pass the sand dunes on your left. 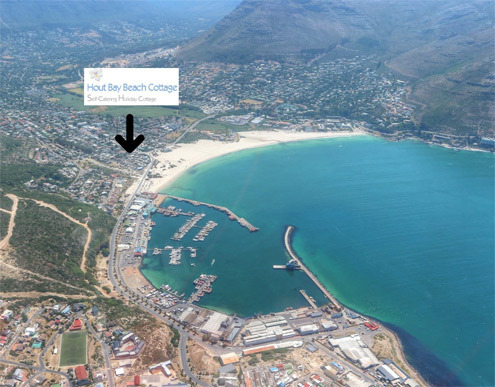 Turn first right into Albert Road and Hout Bay Beach Cottage is No.16 on your right.